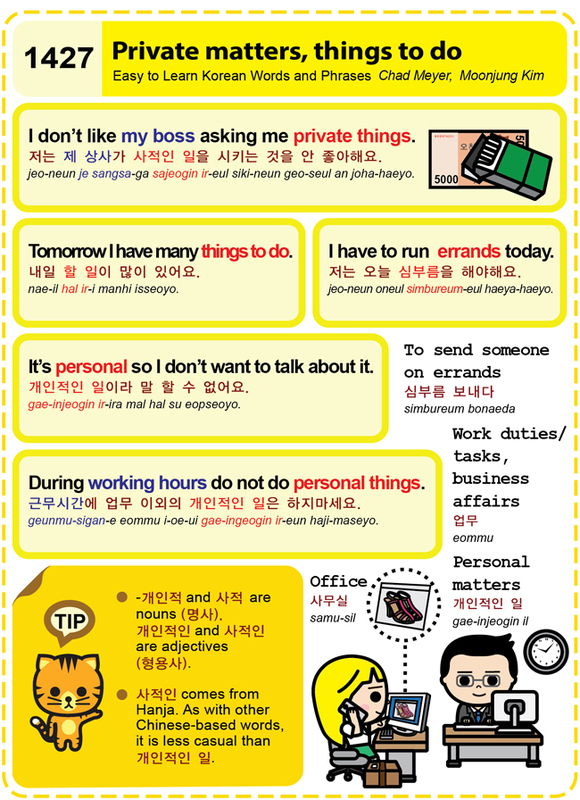 Easy to Learn Korean 1427 – Private matters, things to do. This entry was posted in Series and tagged -개인적, business affairs, During working hours do not to personal things., I don’t like my boss asking me private things., I have to run errands today., It’s personal so I don’t want to talk about it., office, personal matters, private matters, samusil, things to do, To send someone on errands, Tomorrow I have many things to do., Work duties/ tasks, 개인적인, 개인적인 일, 개인적인 일이라 말 할 수 없어요., 근무시간에 업무 이외의 개인적인 일은 하지마세요., 내일 할 일이 많이 있어요., 명사, 사무실, 사적, 사적인, 심부름 보내다, 업무, 저는 오늘 심부름을 해야해요., 저는 제 상사가 사적인 일을 시키는 것을 안 좋아해요., 형용사 by easykorean. Bookmark the permalink.